Student gift bags are a fun and healthy surprise. For the past couple weeks, students have been settling into their new digs, immersing themselves in coursework and establishing a routine. Now is the perfect time to send your student a fun, healthy break via MGift. MGifts are available for any occasion -- from welcome packages to study breaks to get well bags. All MGifts come packaged in a reusable bag. You can also add a gift card by purchasing one separately. 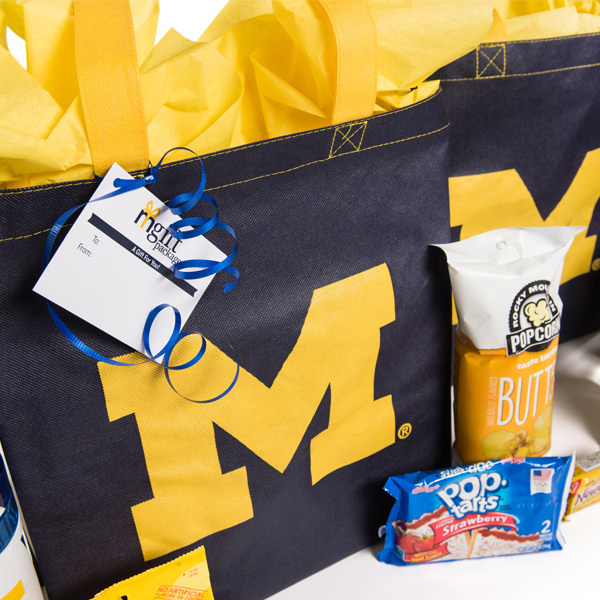 Welcome - The Welcome Package includes Go Blue gear -- a throw, umbrella, journal, keychain, pen, cell phone holder, bottled water, reusable water bottle, travel mug and house-made M|Dining granola. Study Break - This gift includes a big selection of goodies to take the stress out of exams. The bag is filled with soda, crunchy snacks, assorted cookies and sweets, Pop Tarts and a Michigan travel mug. Get Well - Help your student feel better faster with this collection. The bag includes soup and saltines, fresh fruit, cough drops, soda, bottled water, a reusable water bottle, tissues and hand sanitizer. In addition, Halloween and Valentine’s Day Gifts are also being planned. You can order MGifts using the new GET app or through the GET online portal. Nine locations are available for student pickup for free or the package can be delivered to any residential hall community center for a $10 charge. MGifts was recently launched MDining. When you send an MGift, a percentage of the sale goes to support U-M student programs and campus facilities. For more information, or to order a gift bag, visit dining.umich.edu/mgifts.